We have started spotting butterflies in our yard when we are outside playing and I am so happy that my son still stops what he is doing to watch them flutter by. 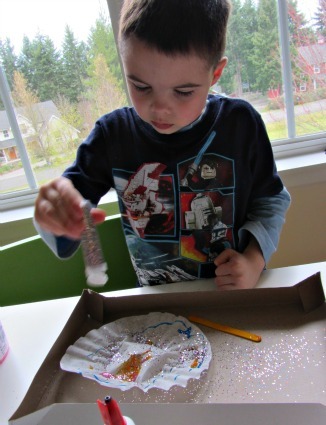 This is a classic kids craft but by using the colored glue we made and glitter it’s a little special even for a jaded crafter like my son . 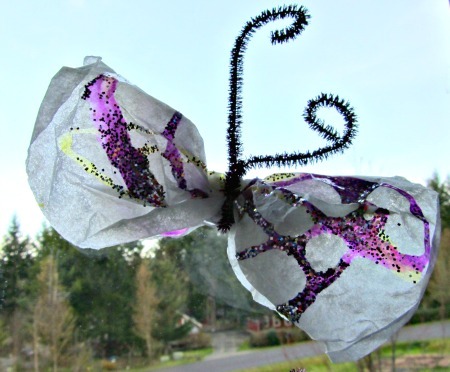 I like how the colored glue can be seen through the wings and in the window it looks like a sun catcher. 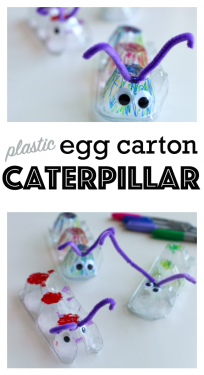 My kids had a ball and I think it was a great reminder that classic crafts are classic for a reason. Gather your materials. 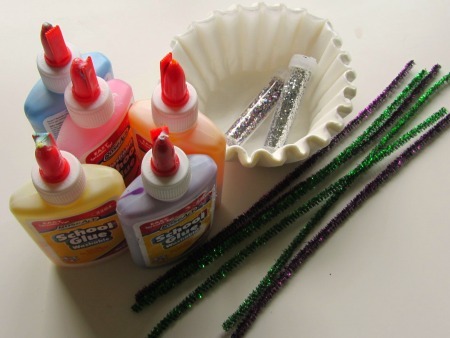 You will need some coffee filters, some colored glue, glitter and pipe cleaners. 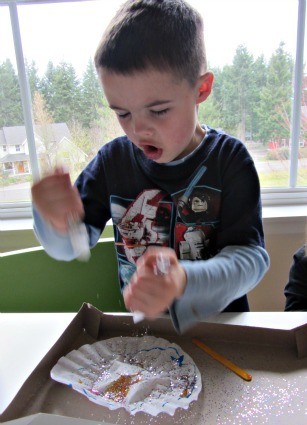 My kids love the sparkly ones from craftprojectideas.com . 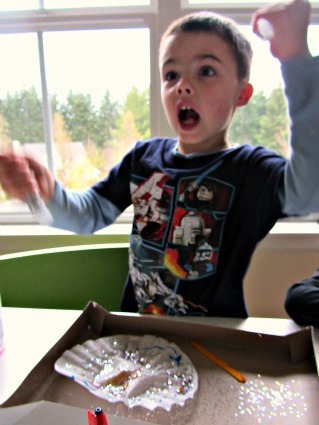 Also when we are doing glitter I like to shake it into a bow lid, or other container to keep it a little contained. 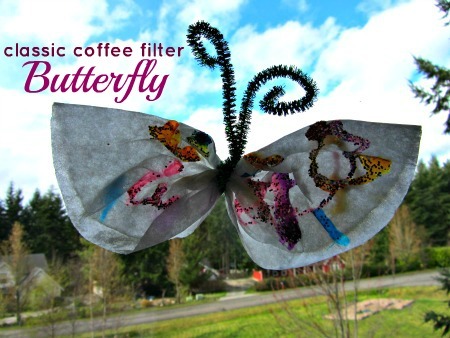 Start by drizzling the glue all over the coffee filter. While my daughter did this my son was playing nearby. 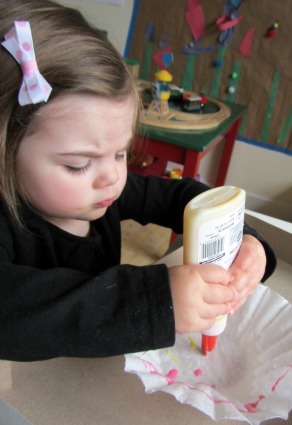 She loved squeezing the glue and we took the opportunity to talk about colors too. Add the glitter! She was tame compared to her brother …. you’ll see what I mean in a bit. She was happy with one so I invited my son who wasn’t ready yet. So we played for a while then started the craft. This worked well because I got my daughter engaged so she was happily playing alone when my son decided he was ready. He wanted to make a monarch butterfly because they migrate. OK. So he was trying to mix the red and yellow paint to make orange. And guess who decided she wanted to make another. 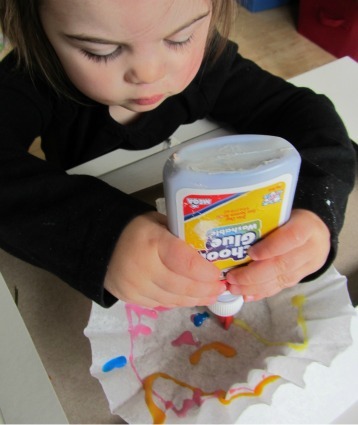 I only had one box and my son was using it so I gave my daughter about 5 layers of coffee fliter so the colored glue didn’t seep through to the unprotected table. It worked well. And he went bananas. He made up a silly song about glitter and had us all giggling. Yes it was a mess but it was funny and silly and happy and I am a total sucker for funny. We let them dry over night ( on way paper so the glue that ran through the filters wouldn’t stain anything). Did you really think I’d have a post without at least one of my kids in PJs? Then wound the pipe cleaners around them. Put them in the window . 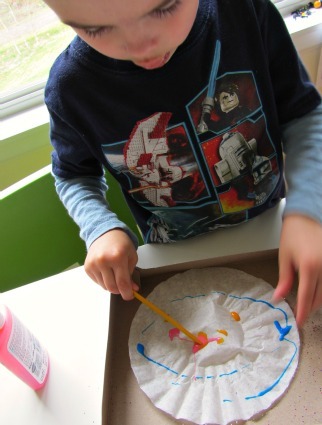 I still have glitter to clean up – my son helped but I think he just spread it. The library may get a few books returned that shine figuratively and literally. When she woke up she was a butterfly. I agree! A Classic Craft series would be a great idea! Those of us without early childhood education backgrounds don’t have all that knowledge of how to do them or what they are. It’s also nice to have a nudge to remind us about those we do know how to do. My most fun crafts I’ve done with my girls have had an element of nostalgia that I had done them as a little girl, too. They are classic for a reason :). 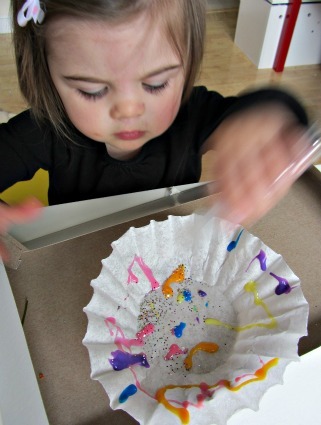 Plus, you always throw in great tips on how to incorporate other learning (like colors in this activity) into all the crafts you do, as well as tips on how to manage the process (like use 5 layers of coffee filter so the glue doesn’t seep through to the table). It wouldn’t be an old and boring tutorial. 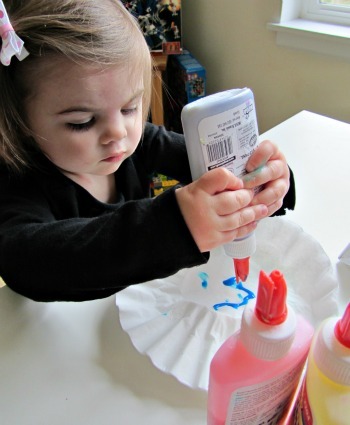 Kids love to do some crafts like this. They enjoy colors and everything. 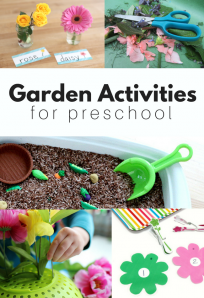 This is the best way to set their minds to do beautiful things aside from playing outside. They can also develop their talent in art. Thanks for sharing this wonderful post! I love those butterflies! How lovely these kids are. 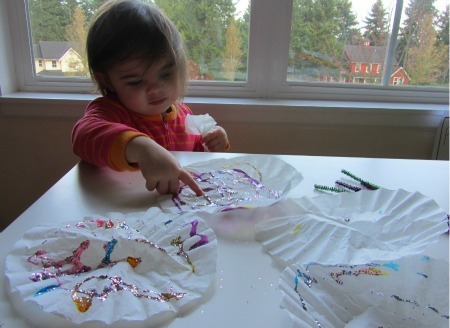 At their very young age, you could see their talent and skills in making artworks. 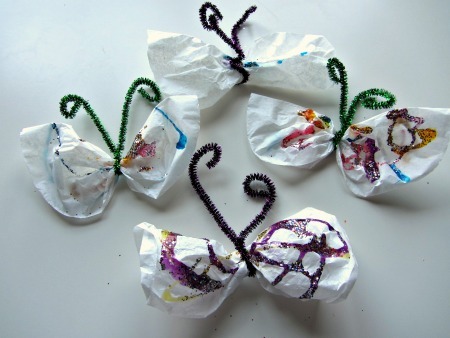 I would love to make these butterflies too with my pretty little cousins. Love your classic idea! 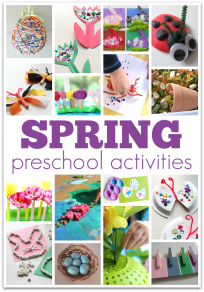 I’m sure a lot of kids will enjoy to do crafts like this, to unleash their creative talents in making their own masterpiece. Thanks for sharing this to us!